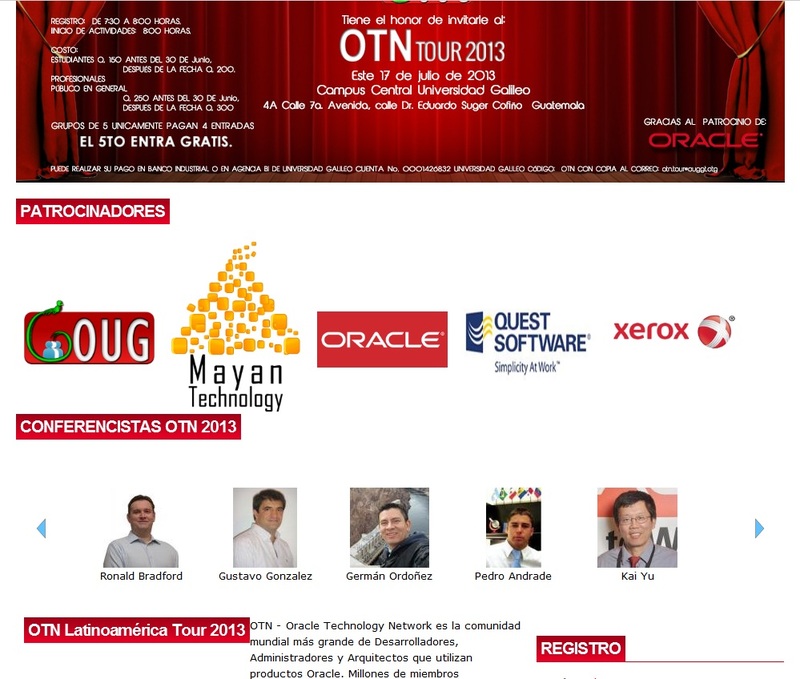 July 14-24, 2013, I participated 2013 OTN (Oracle Technology Network ) Latin America conference tour. 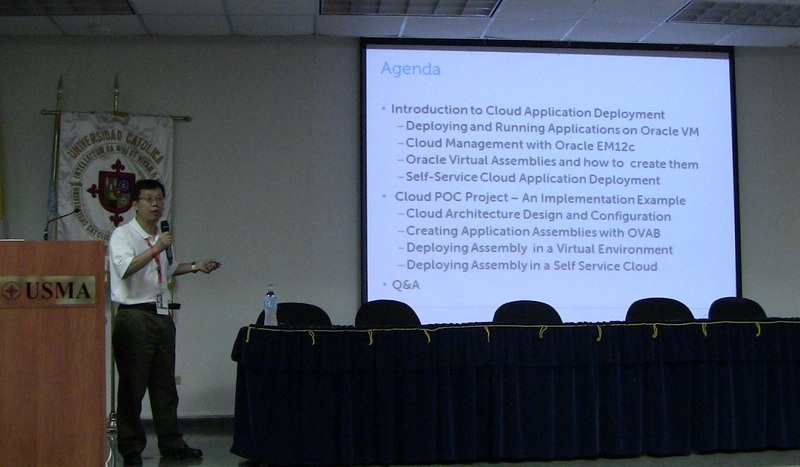 During this tour I gave nine presentations at four conferences: OUG Ecuador , OUG Guatemala, Oug Panama, OUG COsta Rica. The presentaions covered the following topics. The actual presentations will be uploaded into this blog site under ‘Presentation’ tab. Today in a database cloud that consolidates a large number of databases with different SLAs, any unplanned outage can be devastating and a small planned downtime may not be acceptable. The infrastructure high availability becomes extremely critical to a database cloud. This session will start with the system architect design and discuss the various techniques and options to achieve the high availability such as Oracle Clusterware/RAC, Data Guard and Oracle MAA. Then it will explore the configuration best practices to ensure fault tolerance of the entire stack of the infrastructure. It will also discuss the methods to reduce downtime during events like system upgrade and migration and the troubleshooting during system outage. This presentation will discuss soem of Oracle 12c new features such as Oracle Flex Clusters, Oracl Pluggable databases running on Oracle RAC 12c. Oracle virtual assemblies provide a great way to simply the deployment of enterprise-class multi-tier applications and their configuration dependencies. Oracle Virtual Assembly Builder 11gR1 can create Oracle virtual assembly packages by capturing the state of an installed application topology. Oracle Enterprise Manager 12c can deploy these assemblies in the cloud resulting in fully operational application stack within minutes. This session will walk you step by step through the Oracle virtual assembly creation process. Then we will discuss the configuration of an infrastructure cloud based on Oracle VM and Oracle Enterprise Manager 12c Cloud Control and demonstrate how to use Oracle Enterprise Manager 12c Cloud Control to deploy an assembly on the Oracle infrastructure cloud. PCIe SSD is an enterprise class high performance storage device. It is built with SLC NAND flash and designed for applications that require low latency and high IOPs (IO Per Second) operation. OLTP database workloads which require very low storage IO latency with many small random read/write IO operations are the ideal cases to use PCIe SSDs to improve the performance. To understand how much PCIe SSDs can really improve OLTP database performance and the related best practices, we have done a series of performance studies of using PCIe SSD for various Oracle database configurations including PCI SSD as Oracle smart flash cache. This studies are based a single node Oracle 11g R2 database as well as a two node 11gR2 Oracle Real Application clusters (RAC) database with Oracle Enterprise Linux 6.2 platform. This presentation is to examine each of these case studies and the compare the performance improvements of these cases.